Dutch builder Ferus Smit has launched the fourth in a series of 10 open-hatch, single-deck, ice-classed cargo carriers for Ireland-based Arklow Shipping. Delivered in April, the US$5.97 million Arklow Clan was constructed at Ferus Smit’s Westerbroek yard, as were her predecessors, Arklow Castle (launched in January this year) and Arklow Cadet and Arklow Cape (both completed and launched last year). Like her completed and forthcoming sisters, Arklow Clan features an overall length of 87.4m, a moulded breadth of 14.99m and a moulded depth of 7.12m. The vessel has been designed with a deadweight in excess of 5,000tonnes, but retains a gross tonnage of less than 3,000tonnes. As per the owner’s request, the ship’s bottom has been strengthened for loading aground, while the tank top has been strengthened to handle heavy cargoes. The vessel’s hold measures 59.8m x 12.6m x 8.5m, comprising a total volume of 6,229.7m3, and is equipped with a CO2 fire extinguishing system. Design considerations include the use of portable bulkheads for cargo separation. Arklow Clan relies on a single MaK 6M25 engine, rated 1,740kW, which drives a single-ducted controllable-pitch propeller, resulting in a speed of approximately 11knots. Arklow Shipping estimates that the vessel will most likely burn up to 7.5tonnes of fuel per day. Meanwhile, Dutch marine and offshore technical solutions provider Eekels has been contracted to provide a comprehensive electrical package for all 10 Arklow vessels under build at Ferus Smit. This package includes: a 400V main and emergency switchboard; a 275kW bow thruster engine and frequency drive; a shaft generator; the vessel’s alarm system; bridge control panels; and all lighting, including search lights. 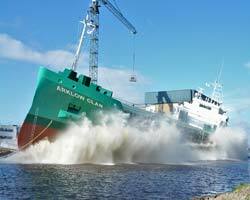 Arklow Clan has been classified by Bureau Veritas and awarded the notations I + Hull + Mach, Ice Class Finnish 1A, General Cargo Ship and Unrestricted Navigation. She is scheduled for handover to Arklow in May.